On this weeks show I am sharing all the details of our Fly and Drive vacation to parts warm! We left cold and snowy New Jersey with temps in the 30’s and flew to warm and sunny LA. Once there we picked up a Class C Motorhome that we rented from El Monte RV in Van Nuys, California. We were in deep need of sun but also in need of a camping fix. Our trailer had been parked in the driveway for over four months and it would be at least another six weeks before it would be safe to de-winterize it. Our niece was getting married in Palm Springs, California the first weekend in March and I had a big RV industry event in Salt Lake City, Utah the third week in March. I could fly home and go back 10 days later or, I could rent an RV, get a camping fix and get some sun. I’d never been in this part of the country before and couldn’t pass up the opportunity to explore it by RV without having to spend five days driving there. The 25’ Four Winds we rented had a great floor plan and was a 2018 with only 25k miles on it. I contacted El Monte in Van Nuys, California to ask if I could do a one way rental, picking it up in LA and dropping it off in Salt Lake City. Although it is not an option at all of their 20 locations across the country, it was available from Van Nuys to Salt Lake City for around $850 for ten days. I have never driven a Class C before so I decided I wanted the smallest and least complicated model available. I chose the 25′ Thor Four Winds without any slide outs. It had a rear bed with a cab over bunk for extra sleeping and a booth that folded down to create an additional bed. The swivel chair was a favorite spot for my husband. He claimed it as his official chair! When we first pulled into the Van Nuys location there were several motor homes parked up front. We noticed a sign hanging from the rear view mirror on one of them that read, “Vacation Ready – Pettit! !” and boy, were they correct! We were vacation ready! The pick up went very smoothly and we were at the location less than 90 minutes. We watched a 20 minute video on the motor homes systems which I recorded on my phone just in case we needed reminding. All of the systems were very similar to my travel trailer and we never needed to revisit the video. The staff was great and had all the paperwork ready ahead of time. We opted to take out an insurance policy with our agent from home before we got there and we saved a lot of money by doing that. The El Monte policy was $30 per day. We were planning a ten day trip so that would have added up. Our agent wrote us a policy for the ten days for $35.00. After all of the paperwork was done the El Monte rep took us out to our unit and walked us through all of the systems showing us how to operate everything! We left with total confidence. I thought the greeting on the rear view mirror was such a nice touch! El Monte offers a convenience kit for a small additional fee but we opted to bring our own sheets, pillowcases, towels, table cloth, dish towels and blanket along with dinner service for two with cutlery and minimal cooking utensils. We purchased a coffee pot, frying pan, some tupperware, plastic cups that we rewashed and used over and over and four pillows from Target. We spent less than $50 on those items and the items we brought from home were all in a carry on that we didn’t pay an additional airline fee for. I loved having my own sheets, blanket and pillow cases. It felt very homey and immediately made me feel like I was in “my” RV. Having our own linens really made us feel at home. I’ve had this checked table cloth at many camp outs. I was a little nervous about driving something so big but wasn’t on the road for more than five miles when I realized that it’s just a big truck. I drive an F150 as my daily ride and use it as my tow vehicle. It didn’t feel much different than my own truck. We thought that it might be a hassle to have to use it for everything since we were not towing a touring car behind us but it actually wasn’t. The opposite was true. It was very simple to unplug and hit the road with each morning. We were lucky enough to catch the Super Bloom at Joshua Tree National Park. You have to go to the south entrance to catch it. When we toured Joshua Tree National Park we loved being able to pull over at the rest stop and make lunch, use the rest room and take a power nap before continuing our tour of the park. Normally when I hit the wall halfway through a tourist day, I just want to get back to my campsite and be able to put my feet up. With the motor home I was able to take advantage of more things in one day. Taken at Keys View overlook in Joshua Tree National Park. You can see the whole valley from here including Palm Springs, Rancho Mirage, and Coachella. Since our niece got married in Palm Springs we decided to stay there an explore that area first and then move on to Las Vegas. We left our Air B and B where we stayed with family for the wedding and headed to the Palm Springs/Joshua Tree KOA which had all kinds of amenities we took advantage of. They are open year round and were full of snow birds on their way north after a winter in the warmth. At the Palm Springs KOA. I promised my husband if he would come with me I wouldn’t drag him to every tourist site within 100 miles. I kept my promise to wind down and just relax. The location offered a nice pool and three different mineral springs to soak in. We took advantage of that everyday! From there we were able to visit Joshua Tree National Park and do some of the tourist things in Palm Springs. We also just took a day to unwind at the campground. The sun and palm trees were so inviting and we relaxed, read and broke out the water colors. My husband used the gym there each day and also really enjoyed the library and billiards room. Just chilling with some watercolors at the Palm Springs/Joshua Tree KOA. From Palm Springs we headed to the Las Vegas and stayed at the KOA at Sams Town. I think I’m the only person who’s never been to Las Vegas. We loved, loved, loved the campground. It was a neat and tidy little city of RV’s! Chris, the campground manager, met us in his golf cart and led us to our site when we came in the wrong entrance. The staff here was really exceptional from the employees on golf carts delivering our order of Omaha Steaks right to our site, to the store staff unlocking the store for me at 9:00 as they were leaving so I could get cold medicine. The KOA at Sams Town in Las Vegas! It’s a little RV city with heart! We really loved the quiet atmosphere at this campground. Even though it was urban camping and only a few miles from the famous strip, it was really peaceful. Shuttles take RVers to and from the casinos and shows so there’s very little vehicle noise. The pool, bathrooms and laundry facilities were so clean and we caught up on laundry while there. After so many days of cereal and microwaved oatmeal, my husband also really enjoyed the casino breakfast buffet!! Our ride to Hoover Dam on Pink Jeep Tours. Great value! We day tripped it to Hoover Dam using the Pink Jeep Tours service at the recommendation of our camp host. For $95 each we were shuttled in a big pink Jeep with 3 other couples and a very engaging and informed driver. She was a long time local and gave us a great oral history of Las Vegas and the Hoover Dam. It was well worth the money and nice to be a passenger. The bridge from Hoover Dam. The KOA at Sams Town is a great location to fly to and rent an RV. The manager told us that many people pick up their El Monte rental in Las Vegas because the flights are so inexpensive and there are so many sights to go to from there. The Grand Canyon is only three hours away. They often stay there the night before and load the RV with goods from the Walmart across the street. When they return from their travels they leave the chairs,!coffee pots and other camping equipment they purchased and can’t take home. We donated our coffee pot to the pile of camping supplies for renters that they keep on hand. The Sams Town Casino adjacent to The Las Vegas KOA is completely covered with indoor waterfall, light show, shops and a food court. Our last little lesson learned on this trip had to do with food. Normally I take precooked and frozen meals with me in order to have good meals without fussing. After about 6 days on the road and too many sandwiches substituting for dinner, I got the idea to surprise my husband with an order of “real food” from Omaha Steaks. For about $89 I got 4 filet mignons, four burgers and four chicken breasts as well as potatos au gratin and mini apple tarts with caramel. We had great meals for the rest of our trip for less than the cost of dinner for two at a steak house. Omaha Steaks delivered them overnight to the KOA and they arrived the same day we did. I’m definitely going to use them again because the food was delicious and I didn’t waste time looking for a grocery store or shopping. It turned out to be a great option for camping because the food comes in varieties and single servings. Win, win! I’m imagining my next solo trip with steak one night, chicken the next and fish after that. I only wish I’d thought of this sooner! I always give Omaha Steaks for gifts but now I’m going to gift them to myself. I feel like our “seeking sun” vacation was just what we needed to get us over the winter hump in cold Nee Jersey. I was so in need of a camping fix. Just standing in the camp store at KOA looking at bags of charcoal gave me hope that we’d be out there again soon. It also inspired me to plan a trip to the Pacific Northwest and rent an RV. There’s so many places I want to camp in but don’t really want to drive to. 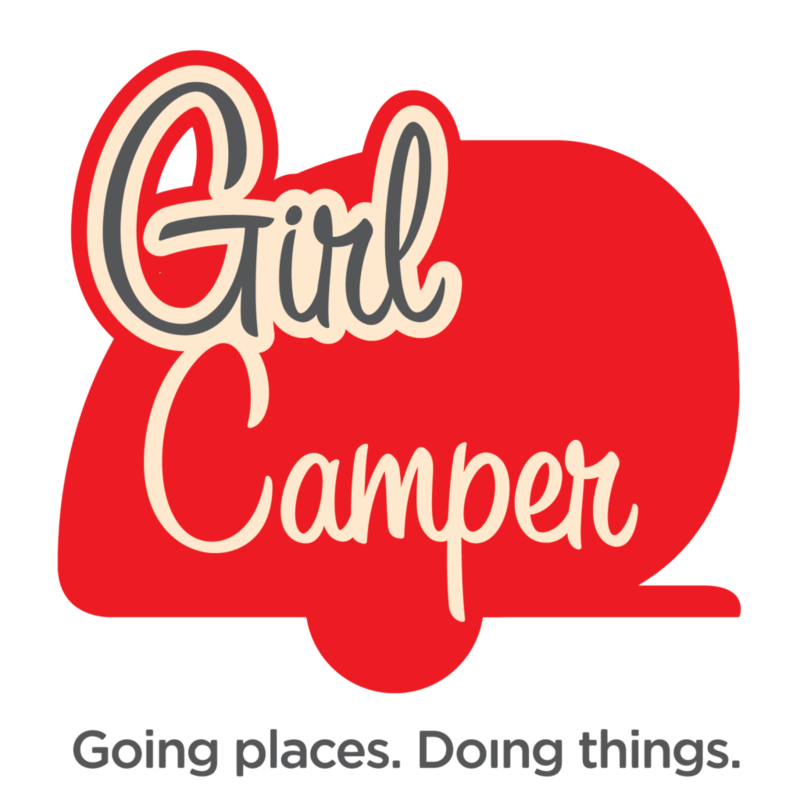 I am imagining several trips a year to events that Girl Campers are holding that I can fly to and rent an RV to share with other women coming from afar. Things I wish I had brought along for the RV. Extension cord – there were only two plugs in the RV and one in the bathroom with none next to the bed for the phone or tablet. 12 volt USB – the rental unit had no upgrades like GPS, bluetooth or USB plugs on the dashboard. We needed the USB for the phone to get GPS and keep the phone charging. Black electrical tape – I carry black electrical tape in my tool kit in my truck and use it to cover all of the LED lights on appliances that light up the coach at night. Washi tape – Washi tape is a low tack craft tape that comes in different designs and colors. I used it in my travel trailer to cover the dome lights over the sink in order to “dim” them. The LED lights are very bright and can’t be dimmed by a switch. 3 M Hooks – There were three rods on the back of the bathroom door for towels but there was no place for wet bathing suits or to hang your jammies in the morning. 3 M hooks are removable and don’t leave a mark. Night Light – I wished I’d brought a night light for the bathroom. I always keep one in my trailer and I missed it. Clothespins – There are so many used for clothespins in an RV. I use them to keep curtains closed, to clip parking tickets to the visor, to keep papers together and close chip bags! Camco refrigerator spring rods – Not only do these pack easily and keep the food from falling over in the fridge but I use them in my trailer to block out the skylight. I put at both ends of the skylight and string a towel between them to block out light.